When you give your horse snacks that you made yourself, you can be sure you aren't adding anything unwanted to his diet, like preservatives, chemicals or too much sugar or grain. Controlling additions to his diet can prevent health problems like laminitis and keep him from getting too excitable. Making your own snacks also saves money without cutting corners on your horse's health. Before making any snack, it's important to know what is and isn't safe for your horse to eat. A horse with Cushing's disease or insulin resistance, for example, should not eat treats that contain rice, corn or bread. No horse should eat foods that contain peanuts, broccoli, tomato, peppers, onion, garlic, chocolate, cabbage, potato or cauliflower. All of these foods can make a horse ill and can be deadly. Don't put meat products in a horse snack, either. If you have any doubts about whether an ingredient is safe, contact your veterinarian. 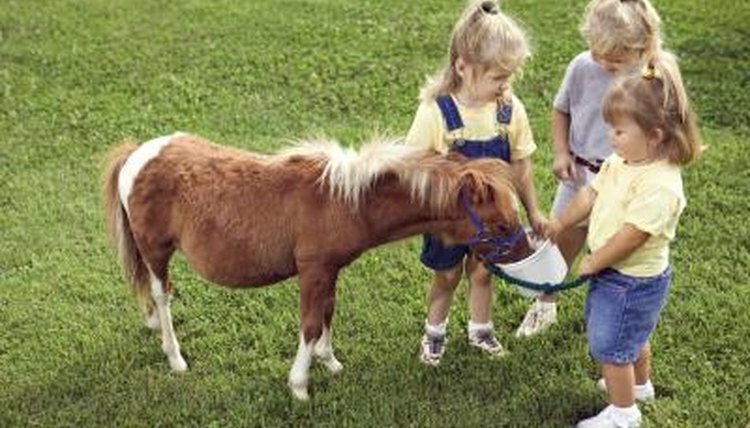 Some horses can have a snack or two every day without any behavioral or weight problems. Other horses gain weight easily. Meanwhile, some horses get "hot" or hyperactive from too much sugar or starch. Feed snacks in moderation so they don't interfere with a nutritious diet. Feed snack in very small amounts at first to make sure your horse doesn't have a negative reaction. Don't give a new treat just before a stressful event like a show, and don't give so much that your horse gains too much weight from snacks. Make homemade snacks using just about anything that is safe for a horse to eat. Carrots, apples, oats, molasses and peppermint are all popular ingredients since most horses consider them tasty. Horse-appropriate cookies, bars and miniature muffins are simple to make and easy to feed. Combine dry ingredients to make a trail-type mix. Hundreds of recipes for homemade horse treats and snacks are available, but most boil down to a basic cookie recipe that you can baked as individual cookies or as a thin cake that you'll cut into bars. Use any cookie recipe that relies on fruit, oats or nuts as a starting point, and add ingredients tempting for a horse, like carrots, apples and oats. An example: Mix 1 cup of flour, 1 cup of oatmeal, 1 tablespoon of salt, 1 tablespoon of sugar and 1/4 cup of molasses as a base, then add your choice of 1/4 cup shredded carrots, chopped apples, crushed peppermints or sweet feed. Drop spoonfuls onto a cookie sheet and bake at 350 degrees Fahrenheit for 15 minutes.